We’d love your help. Let us know what’s wrong with this preview of A Gift for Elizabeth by Jann Rowland. With the spirit of Christmas burning within her, Elizabeth begins to recover f Sundered from her parents and sisters, a depressed Elizabeth Bennet lives with the Gardiners in London, attempting to find anything which will bring purpose to her life. When times seem most desperate, she makes a new acquaintance in Mr. Darcy, and the encounter changes her perspective entirely. To ask other readers questions about A Gift for Elizabeth, please sign up. Separated from her family, Elizabeth Bennet feels lost in London – without purpose or direction in her life. Most of the angst in this story has occurred before the story begins. We know Elizabeth has suffered but her sadness is revealed slowly. She is comfortable living with the Gardiners but needs occupation. She believes she must pursue a life as a companion or governess. Her relatives suggest that she volunteer at a children’s home where she meets the Darcy siblings. She is quickly friends with Georgiana and notices the interest from the girl’s older brother. Darcy does nothing to hide his admiration. But can Elizabeth share the details of her family’s trials? Will her scandal affect his intentions? 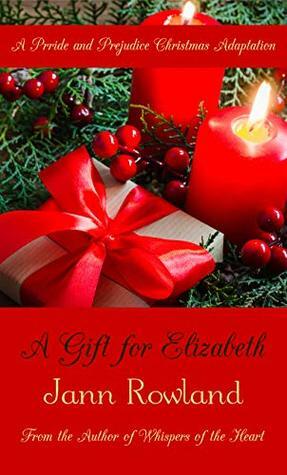 "A Gift for Elizabeth" is a heartwarming Christmas story with a quick route to HEA. The usual villains are included and one of them makes a surprising adjustment. It is well-written and proofread. I would recommend it to anyone who enjoys JAFF. A wonderful Xmas story. A well written P&P variation. Mr. Bennet is gone. Lydia has runaway with a soldier. Jane is married to Bingley. Charles move Mrs. Bennet, Mary and Kitty to Essex leave the scandal behind. Bingley and Jane head north to leave scandal behind. Lizzy goes to the Gardiners to leave scandal behind. So is the beginning of the story. The rest is a classic Xmas novella. I loved the story, probably because it’s two days before Xmas. This is a lovely story set just before Christmas. This book tells the story of Elizabeth in London after a disgrace in her family. She sets out to do something for others which leads her to meeting Mr. Darcy and Georgianna. This progress happily from there. The gift to Elizabeth is a wonderful surprise and leaves you feeling happy. A lovely Christmas story. This was lovely...heartwarming and well written. The beginning is rather suspenseful although we JAFF readers can guess who the young lady sitting in a snowfall while waiting for the long-overdue carriage ride to return home is, we are not given her history. That comes out as she meets both Mr. Darcy and his sister as they, also, have committed time to the Foundling Hospital as volunteers or, for him, as a patron. OCD is quick to see the good qualities in each other. But that history which is hid This was lovely...heartwarming and well written. The beginning is rather suspenseful although we JAFF readers can guess who the young lady sitting in a snowfall while waiting for the long-overdue carriage ride to return home is, we are not given her history. That comes out as she meets both Mr. Darcy and his sister as they, also, have committed time to the Foundling Hospital as volunteers or, for him, as a patron. OCD is quick to see the good qualities in each other. But that history which is hidden comes into play as Elizabeth is sure Mr. Darcy will disdain her company not only for himself but also for his sister if/when he learns of such. Elizabeth is living with her Aunt and Uncle Gardiner. Her family is no longer in Hertfordshire and as to why that is you will have to read for yourself. The circumstances are not exactly as in canon. No, they are much worse. Darcy pays frequent and close attention to Elizabeth and we read of times spent at the orphanage and attention given to the residents there. Each learns about the other's character observing the interaction with denizens much below their level in society. This very sweet Christmas story features a kind young lady who has been forced to live with her relatives upon the death of her father. She meets a benevolent handsome man while volunteering at the local orphanage. They develop a friendship, and she shares her deep rooted secrets which don't seem to scare him away. He defends her to others and proves his love to find their happily ever after. The characters are all based on those in Pride & Prejudice. Other than their names, relationships and This very sweet Christmas story features a kind young lady who has been forced to live with her relatives upon the death of her father. She meets a benevolent handsome man while volunteering at the local orphanage. They develop a friendship, and she shares her deep rooted secrets which don't seem to scare him away. He defends her to others and proves his love to find their happily ever after. A well written novel with a delightful plot. It showed Elizabeth at her lowest level due to the loss of her father, loss of her childhood home, and the disgrace of her sister Lydia. The love of her Aunt and Uncle in Cheapside who took her in and loved her and got her involved in charity work at a foundling home for orphans. While Elizabeth worked with the children in the foundling home, she meets Darcy and Georgiana and with their help, moves from her depressed state to a more amiable self. The children's nearness in the foundling home and her love of helping others, gives her a better view on life and less self pity. Mr. Rowland's writing puts the reader right into the story and you feel Elizabeth's love of those children and their way of seeking love from her as their link to a family. The true meaning of Christmas is shown by Darcy to the children as well as to Elizabeth and her family. There wasn't any ill humor from anyone other than Caroline Bingley in the plot towards Elizabeth. The only trouble that bothered Elizabeth was that she was separated from her family especially her beloved sister, Jane. Love grows not only with Georgiana and Elizabeth but also with Darcy and Elizabeth and he shows his devotion through her and helps her through her difficult times. Love shown by Darcy, Elizabeth and Georgiana to the children with their time, effect, gifts and the reading of the Christmas story. The highlight for the children was when Father Christmas came with gifts for them. This story shows the true love of the Christmas spirit with love, devotion and gifts to others as the love that was shown the night of Christ's Birth! A wonderful novel that will brighten your Christmas time when everyone is so busy to take the time for some reading pleasure. While there were several instances of continuity issues, I for the most part liked this story. It was a quick, sweet, mild drama, happily-ever-after type story. Just what I needed to read today. Loved it I like a book with few villans. Liked the fact that Wickham was already disposed of before the story began. I would have liked an epilogue. I read everything this author puts out because he is a talented wordsmith with some clever and very original ideas for P&P variations. His stories are usually filled with drama, emotion, heartache, villains and adventure. This story is a charming departure from his more serious works, being much shorter and light hearted. The romance of Elizabeth and Darcy is arrived at without all the usual misunderstandings and conflicts, and their connection begins in a charitable foundling hospital of all places. What can be more endearing than meeting while interacting with cute little orphan children? Is this the same author? I’ve read many of Jann Rowland’s books, and was excited to see that he’d published another one. This one, however, was not nearly as well written as the others. There were typos everywhere (he instead of her, etc., references to incorrect people (Mr. Darcy instead of Mr. Gardiner where the two are speaking). I would presume this was a first attempt at writing if I hadn’t already read several by this author. Sadly, I read it to get through as opposed to really enjoying it. Is this the same author? I love reading tales about Christmas with Jane Austen characters. Have not read Jann Rowland's work before but found it wonderful. Look forward to reading more in the future. Had a few twists in the novel that kept my interest and stayed consistent with the original intent. Lizzy was as wonderful as usual. As a stand alone story, this was fine but not my cup of tea. As a Pride and Prejudice variation, I was let down. The characters were not truly themselves. I was simply not convinced that this was our beloved Elizabeth and Darcy. I've read a few others by Rowland and enjoyed them, but this one really missed the mark for scratching the E&D itch. This novel is so well written that it includes just about everything one hopes will be in a clean romance novel of this period. It has exciting, well fleshed out characters and a plot that has some unexpected twists and turns. It deals in a sensitive way with both pathos and joy. I liked this novel very much because it is very different from the other Pride and Prejudice variations. It has romance but other parallel situations that enrich t he narrative. A well-written, entertaining story. One minor quibble: Darcy's surprise for Elizabeth was telegraphed pretty heavily, so it certainly was no surprise for the reader! Well-written P&P variation, with sweet, innocent characters, and not much action. No villains worth naming. Not a bad read, but somewhat forgettable. Proposal is decidedly de trop. Another excellent story from Mr Rowland. Though there is very little angst. Throughly enjoyed the story. Clean, sweet, and a different spin on a favorite book. Evidently it is possible to enjoy a book in spite of a few typos and missing words when the author actually knows how to write an enjoyable story. Lovely Christmas story of ODC first meeting in London. Short but lovely. But this is now several times I have seen several authors get the phrase wrong, as it is Not “putting the horse before the cart (as that is correct order in the first place, but the expression for the wrong sequence (which is what I believe the authors are trying to convey) is definitely: “putting the cart before the horse”. Thank you!